Before a bank/other financial institute extends a loan to a potential borrower, it needs to take a decision on whether the person would be able to repay the interest and principal or default and how much risk is involved in lending money to this person. Banks and other financial institutions rely on many factors to take this decision on credit-worthiness – including the person’s income and household income , the person’s other loans and EMIs, the person’s previous repayment history and defaults if any, etc. The CIBIL TransUnion Score is India’s first credit score for individuals.It is a three-digit numeric summary (ranging from 300 on the lower side to 900 at the higher side) of a consumer’s credit history, compiled from information received from lenders who are members of CIBIL. The model followed by CIBIL predicts the likelihood of an individual missing more than three payments on a credit line over the next 12 months. For the last few years banks have had exclusive access to this score.Now individuals too can access their CIR and credit score for Rs450. 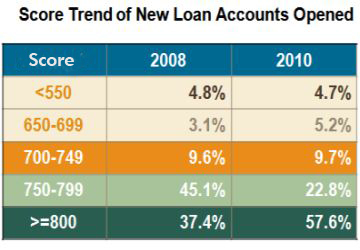 To understand the impact of the CIBIL TransUnion Score on an individual’s loan application we need to take a look at the table below.It shows loans sanctioned by loan providers based on an individual’s CIBILTransUnion Score in 2008 and 2010. How to improve your CIBIL CIR ?